Great comic book creators can move books for most fans sight unseen. I've picked up titles with names like Scott Snyder, Jim Lee, Gail Simone, Joelle Jones, Frank Miller, Mark Waid, etc., on the cover because I knew I'd be getting a quality product. I didn't need to know much about the books themselves to buy them. The same goes for Jeff Lemire especially his creator-owned work. 'Royal City'from Image Comics is his latest and it doesn't feature any superheroes or aliens but Lemire returns to his Essex County roots with an adult family drama that is just as compelling. Patrick's father, the patriarch of the Pike family, is recovering from a heart attack. He's still unconscious and that brings together the dysfunctional estranged family to deal not only with this scary moment but with the past that won't let go of any of them. Lemire creates fully-realized characters that quickly establish their personalities. The overbearing mother, the hen-pecked father, the ambitious daughter trying to drag the old industrial town into the future, the uninspired author son who begrudgingly returns to his hometown and the ghost of the fallen youngest son that haunts them all. Lemire fleshes these people out well thanks to the extended length of the issue. What makes 'Royal City' relatable and poignant is the conflict found in the fragility of humans and their inability to forgive, compromise, and stop being selfish. I couldn't help be reminded of the 1980 Academy Award winning 'Ordinary People.' That film involves the disintegration of an upper-middle class family in Illinois following the death of one of their sons in a boating accident.While 'Royal City' is nowhere near as somber and emotionally wrenching (at least not yet) as that film, similar tribulations are faced by this middle-class family. The art is all Lemire as well with his signature style and colors. You can see the care and love he puts in every panel. The intricate detail, the character designs and there's something about the occasional close-ups that are so striking. He conveys so much emotion and thought from a character's face it's really a rare feat. 'Royal City' is great storytelling with nary a cape, a gun, or a monster in sight. It stands all on its own even if didn't offer mild subtle fantasy elements. Admittedly, it won't be for everyone. It's a serious immersion in the lives of these characters and you'll become invested if you want to but not everyone will appreciate a passionate piece of work like this. 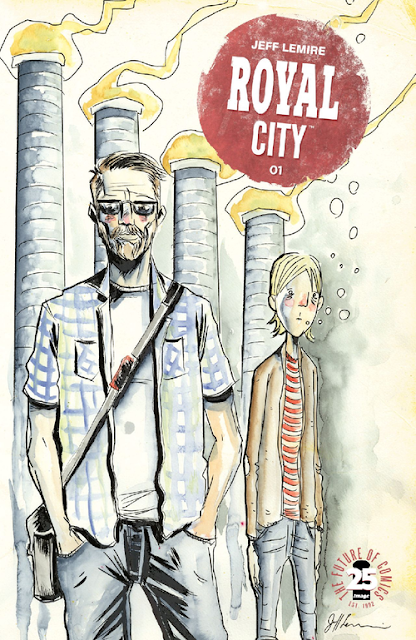 'Royal City' is the class of comic book storytelling.